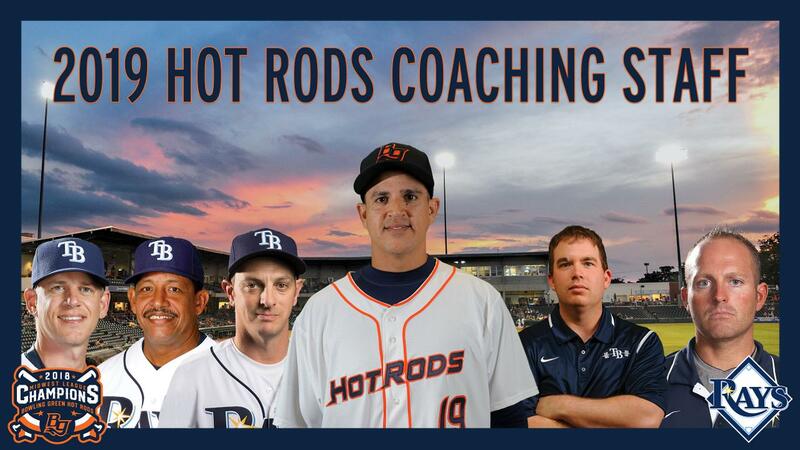 Bowling Green, KY- The Bowling Green Hot Rods, Class-A affiliate of the Tampa Bay Rays, announced their coaching staff for the 2019 season on Friday. Manager Reinaldo Ruiz returns for his fourth season total in Bowling Green. He will be joined by Pitching Coach Brian Reith, Coaches Manny Castillo and Jeremy Owens, as well as Athletic Trainer Brian Newman and Conditioning Coach James McCallie. "We are very excited to have Reinaldo back in Bowling Green after a season away," said Hot Rods GM/COO Eric C. Leach. "He provides great leadership for the team and we can't wait to have him back guiding the Hot Rods." "Having the entire coaching staff back from last season's championship team is also a huge boost. They are great teachers of the game and know how to mold and shape the players to develop and win." Leach added. Ruiz, who begins his tenth season as a coach in the Tampa Bay organization, comes off a year in which he led the Port Charlotte Stone Crabs. Reinaldo led the Hot Rods for three seasons from 2015-2017, guiding them to back to back playoff appearances in 15'-16". Ruiz enters his 23rd season in professional baseball, and his 15th in a coaching or managing role. He has an all-time managerial record of 298-253 in four seasons, and has finished every season at .500 or better. In addition to a stint in the Australian Baseball League, he has made stops in Port Charlette, Princeton, Hudson Valley, and the Gulf Coast League. Reith returns to Bowling Green after serving as the Hot Rods Pitching Coach for last season championship team. His staff finished with the fifth-best team ERA in the New York-Penn League last season. He enjoyed a three-year Major League career, spending all three seasons with the Cincinnati Reds. He finished with a 4-12 career record with a 5.92 ERA. In 73 games (nine starts), he pitched 127.2 innings, allowing 147 hits and 84 earned runs, ringing up 85 strikeouts. A Fort Wayne native, he finished his playing career with three seasons in Independent and Mexican League ball. Castillo returns to Bowling Green for his sixth total season with the Hot Rods. He has helped the Hot Rods reach the playoffs in five separate years. Manny has 46 years working in baseball in some capacity. His career began when he signed as a 16-year-old out of Santo Domingo, Dominican Republic. Owens, comes back to Bowling Green after a tremendous 2018 season working with Hot Rods hitters. Jeremy helped guide the Hot Rods offense to lead the Midwest League in Batting Average, Hits, RBI's, and OPS. The Hot Rods offense also was 2nd in the league in Doubles and OBP. Newman returns to Bowling Green for a second season, while McCallie returns to town for his third consecutive season.